Happy New Year! 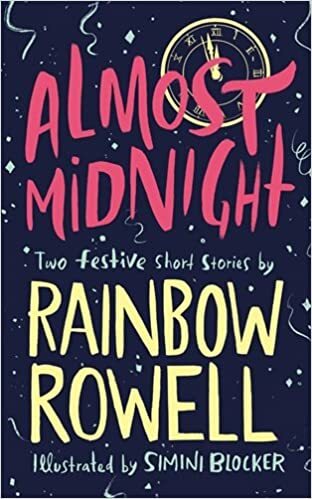 As a treat to myself I purchased this sparkly-covered illustrated version of two of Rainbow Rowell’s short stories which I have already read and reviewed. I love Simini Blocker’s art (I have two of her posters at home) and I love Rainbow Rowell so this was a bit of a no brainer for me. For those of you unfamiliar, these are pretty good gateway drugs to Rainbow. Midnights is very much like her novel length works. We experience four new years’ eves with two teens who are clearly in love with each other and don’t necessarily know what to do with those feelings. 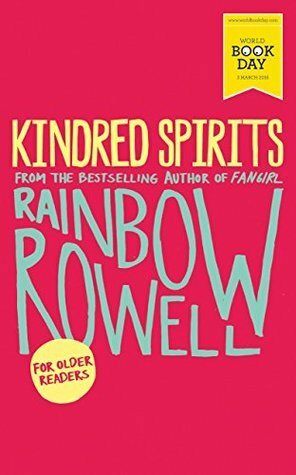 I am fond of proselytizing the good word of Rowell’s ability to craft delightful, wonderful characters and these two are no less delightful and wonderful than her others. I first read this story three years ago and they are firmly lodged in my memory the way few other story’s characters are. Also, it pulls at the heartstrings, the watching the one you want not quite manage to want you as well. The second story is Kindred Spirits which focuses on Elena and her excitement to experience The Force Awakens, her first true Star Wars theatre experience. We spend a few days in her company as she endeavors to have the line experience the original series and prequels audiences had. Hers isn’t like those, exactly, but she does come away with an experience all her own and a new friendship which helps her unpack the relationships she and others have to nerd culture. For me, I didn’t see The Last Jedi until just a few days ago and have watched certain sectors of fandom expose themselves as not being ready for where the movies are taking them. Rowell isn’t necessarily anticipating that, but this is a nice companion read to any viewing of a new Star Wars movie. This book was read and reviewed as part of the charitable Cannonball Read, my last for CBR9. At Cannonball Read we read what we want, review it how we see fit (within a few guidelines), and raise money in the name of a fallen friend for the American Cancer Society. Registration for our 10th annual read is open through January 2018. I love Rainbow Rowell, and I love the characters she creates. I also love how much she loves my favorite month of the year. This is my second time through Attachments and while looking back I can see all the ways in which Rowell has grown as an author but my affection for this story has only grown. I rated this one 4 stars when I last read it for CBR5, but I’ve gone ahead and rated it five stars this time. The first time through what sold me on this book and Rowell as an author was the characterization. I could not help but fall in love with each of our leads as they navigated their various life struggles. Rowell delivers honest character reactions and flaws in everything she writes. This time I noticed the pacing. In the beginning of the book things move slowly, reflecting the status of the lives of Beth, Jennifer, and Lincoln. As each character’s arc progresses the pace picks up in concert with it. The end of the novel appears to come to a halt, but instead it is fast-forwarding towards the earned resolution. I love Beth and Jennifer’s emails, I love Doris, I love Lincoln’s sister rebelling against their mother by being “normal”, I love Lincoln’s loyalty and bravery as well as his inertia. I love Mitch who falls in love with a Jennifer who still all these years later doesn’t know how she got so lucky, I love Chris being so stuck in what it takes to be an artist that he loses how to be a person. I love it all so very, very much. And I’m incredibly thankful that Hasen Klub tracked down a hardcover copy of this book for me to round out my Rainbow Rowell collection. This book was read and reviewed as part of the charitable Cannonball Read where we read what we want, review it as we see fit (with a few guidelines), and raise money for the American Cancer Society in the name of a fallen friend. I am the World Book Day Book Fairy. I thought I ordered one copy of the book; I actually received closer to 4 dozen from the book depository. I am not the only person this happened to, as the internet has let me know, and somehow I think it was on purpose, that we were led to believe we were getting one, and got so many more so that we would have the opportunity to send the book further out into the world. I had a blast mailing the book to Cannonball friends and foisting piles of books on my local friends who have taken them off further into the world including school libraries (crystalclear for the win!). The joyful spirit of World Book Day was matched in Kindred Spirits and Elena’s hunt for the line experience for The Force Awakens. Elena is all about Star Wars and this short story focuses on the few days and few new faces Elena encounters along the way. While the line isn’t anything like what Elena expected based on the prequels or the original releases (what have you done to us online preordering?). The book is very much a meditation on what our particular pop culture preferences. Elena’s love of Star Wars is shared with her family, but not her friends so she is out on her own for the line. Gabe and Troy are the others in line, and each brings their own particular fan experiences. Maybe my favorite part of the novella was the discussion between Elena and Gabe about girls and nerd culture, and with the mainstreaming of nerd culture if it really exists anymore. Not my favorite Rowell work, but certainly enjoyable for the Rainbow fans out there. I am not one, normally, for short story collections. Inevitably there are some which are too long, and some which are too short. And some that are just, well, terrible. My True Love Gave To Me is no exception to these general rules of short story collections. The Lady and the Fox by Kelly Link – a story of what happens with a little holiday magic, a little good luck after lots of bad luck, and a boy seemingly caught in time and space. This one leans towards Fantasy and is exquisitely well paced. 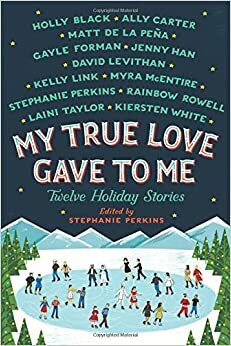 It’s a Yuletide Miracle, Charlie Brown by Stephanie Perkins – My favorite of the bunch, this story tells the tale of one evening with Marigold and North as they fall for each other while literally unpacking Marigold’s baggage. A laugh out loud funny story. Midnights by Rainbow Rowell – Rowell is the only author I’m sure I’ve previously read. This short story is very much like her novel length works. We experience four new years’ eves with two teens who are clearly in love with each other and don’t necessarily know what to do with those feelings. This one is another outing of pitch perfect characterization for Rowell. The Girl Who Woke the Dreamer by Laini Taylor – perhaps the least Christmassy of the twelve stories in this collection, it is however the most romantic. In a post-apocalyptic future (I think) Neve is about to come of age and the tradition is that suitors leave tokens for their chosen wife during advent and marriages are made on Christmas Eve. In fear of her suitor, Neve calls out to the old gods, and awakens the Dreamer, who in turn falls in love with her spirit. This one is absolutely fantasy. The language is gorgeous and sumptuous, much like the Dreamer’s gifts. Angels in the Snow by Matt De La Pena – Our protagonist, Shy, is trapped in a blizzard with next to nothing to eat, leaving him with nothing but time to dwell on his issues. Luckily for him there’s an interesting girl in the apartment above, but she’s not going to let him off easy. The pacing came and went, but this is a good story. What the Hell Have You Done, Sophie Roth by Gayle Forman – the Hannukah tale of the bunch, Sophie Roth has ended up at college in a small town in the middle of nowhere, and its making her feel very much the big city fish out of water. Until, she meets someone else who may just be the fish she needed to meet. I really like Sophie as a character, and I liked that she screwed up as much as she got things right. I just didn’t love it. Your Temporary Santa by David Levithan – When his boyfriend Connor asked him to dress up as Santa Claus to convince Connor’s younger sister that there is a Santa Claus for one more year. But in the process he learns more about his boyfriend’s family and his place in his life. This one was good, but left me wanting more. Beer Buckets and Baby Jesus by Myra McEntire – Vaughn has a reputation for causing trouble, and its just one of those instances that lands him serving community service helping to repair the Christmas Nativity that he (accidentally) burned down. Hilarity, hijinks, and love, ensue. Welcome to Christmas, CA by Kiersten White – this one was saved by its ending. Maria lives with her mom and her boyfriend in Christmas, CA. She works at the Christmas Café, and life is pretty miserable. Until Ben shows up as the new cook and things take a turn for the strange. Krampuslauf by Holly Black – This one is like the photo negative of The Girl Who Woke the Dreamer. What Laini Taylor go right in bring the fantastical to life Holly Black does wrong in this story which seemingly never ended. Star of Bethlehem by Ally Carter – This one had such potential, but was given short shrift. Lydia changes tickets with Hulda, a foreign exchange student, and finds herself in Oklahoma instead of New York. She’s running from a big bad thing, but this short story doesn’t give it, or her growing feelings for Ethan, enough time to evolve. Polaris is Where You’ll Find Me by Jenny Han – this story made me angry. So angry. Santa adopts an orphan from South Korea 15 years ago, and now she’s growing up in the North Pole and falling in love with an elf. There is so much teenage angst and so little payoff. And the ending is sad. This review was completed as part of the Cannonball Read. As we approach Thanksgiving here in the U.S. I’m reminded of the things I’m thankful for, and in the last several years Cannonball Read is one of the things I am extremely thankful for. It’s helped reignite my love of reading, its introduced me to a group of people who also love to be bookish readers and talk about what they’re reading and why it’s affecting them the way it is. And its helped pull me outside of myself in my real life as whole new conversations are starting with coworkers and friends about what we’re reading, and what they think I should read next, and just how scathing or bonkers a particular review of mine has gone. But perhaps most importantly it’s exposed me to authors and books I may have otherwise missed. The prime example of that are Rainbow Rowell and her four books (so far!). I have loved them each individually and I love them as a group. I have bought copies for family, will begin pushing them on friends immediately, and generally sing their praises. Not every book or author is for everyone, but Rainbow Rowell and her books are for me. 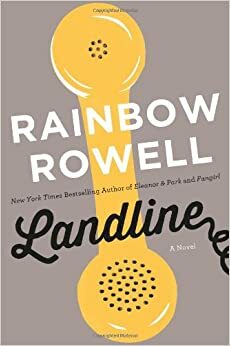 Landline, my 52nd book this year, is definitely a book for me even though I’m not married, I don’t have kids, and I certainly don’t have a magic phone that lets me talk to the love of my life 15 years ago. But, these characters jumped off the page, dug down into my soul and meditated there for a while letting me I think about the big idea. The plot (minus the magic phone, seriously don’t worry about the phone, accept the timey wimey-ness and move on) is relatively standard in adult fiction. What happens to your life when you take for granted those you love and who love you and you make not good decisions? What is the consequence? How do you make it right? Can you make it right? Should you make it right? Georgie McCool, our protagonist, ruminates on just those points for the majority of the 300 pages of this book. She seemingly has made one poor decision too many, she sees herself as the nexus of her husband’s unhappy life. So when the opportunity to speak to Neal in the days leading up to his proposal 15 years ago happens, she must decide whether she’s trying to make it happen, or trying to spare him the pain that binding his life to hers will cause. I was able to relate to the self-doubt Georgie feels, and also the perceived lack of career trajectory that she sees in Neal. Georgie has a problem I think a lot of super career driven people have – they don’t see that for many people their job isn’t what gives their life meaning. In my reading of this book it comes across that family and kids are what give Neal’s life meaning, and therefore it doesn’t matter to him that he left a relatively dead end science job to stay home and be a dad, a position he tells Georgie is absolutely necessary when they are first married, when she thinks they’re optional because she was raised without hers. But it’s this perceived slight, that Neal gave something up so that Georgie could do the thing that drives her (being a comedy script writer for television) causes Georgie nearly as much strife as the possibility of Neal walking away from their marriage. This isn’t necessarily a happy read, even at the end, but the language and word choice keep you on your toes and enjoying the read. Rainbow’s characters sound like real people. Rainbow’s writing isn’t the big sweeping bold word choice that generally accompanies the classics of American literature, but its so precise, and rings so true that it just sits with you. She plays with form and function, and in Landline parenthetical phrases are used to clarify Georgie’s inner dialogue and if you’re a reader of my reviews, you know I love a parenthetical phrase. (I really, really do). Rainbow’s used other things in each of her books, and they each add a layer of meaning, a layer of depth, to the proceedings. They are the icing on a superbly baked cake. You may ask yourself if I am so obviously in love with the book, its author, and its sibling books why am I not rating it 5 stars. The answer is simply that while I know Georgie at the end of this book, and I’m pretty sure I’ve got Neal nailed down, I don’t really know the other characters. This one doesn’t have the beautifully fleshed out supporting cast of characters that other Rowell books have. That slides this one firmly into 4.5 stars for me. But, I’ll let you know that if you saw my meltdown at half-cannonball time about wanting more, more, more at the end of Fangirl that I loved the Easter egg in Landline and it gave me enough closure to go ahead and rerate that a 5 star book, since I was being silly abut withholding it in the first place. Read this book, and everyone in the pool, I made my cannonball goal! This review is part of the Cannonball Read. It is a truth universally acknowledged that Rainbow Rowell is one of my two favorite new authors of the past few years. She and Lyndsay Faye have been rocking my literary world, and I am so glad for it. I saved Fangirl to be my 26th book this year, and timed it to coincide with my vacation. I had planes and beach ahead of me, so the timing was perfect. And there is so much to love about the story of Cath. So much that is good, and interesting, and superbly executed. Really, I’ve come to expect that I will simply fall in love with Rainbow’s characters because they are so real, and I do. Every. Single. Time. I love Rainbow Rowell, and it’s easy to see why. But, (and there is a but) several days after finishing the book I’m still hung up on the ending that wasn’t. I follow Rainbow on Twitter, where she is just as lovely as you could hope, and there are a lot of people who tweet at her about those three words at the end of Eleanor & Park. I have never understood those people. Until I got to the last 5 pages of Fangirl. And then I just wanted more. I wanted more Cath and Levi, more Simon Snow and the Eighth Dance, and more Carry On, Simon. I wanted more of all of it. I wanted more than just the signposts pointing me in the direction of the resolution; I wanted to see it there, on the page, right in front of my nose. I am apparently very needy. I think I’m needy because in oh so many ways, I am Cath. I was the girl who wouldn’t go down to the cafeteria because “all the trickiest rules are the ones nobody bothers to explain to you. (And the ones you can’t Google.” I’m the person who doesn’t understand how people are naturally ‘on’ all the time and don’t need time alone to recharge. Writing can feel like running downhill towards the thing that makes sense, while real life seems to be out on the edges. I need my own Wren or Reagan to pull me back in from the outside edges. Heck, I want to be as quippy as Reagan. I love Rainbow Rowell’s characters. Even when we aren’t meant to like, or agree with them, she manages to fully flesh them out in a way that at the very least makes them relatable. Which, to me, is something to aspire to as a writer. I can only hope that the characters I scribble can someday become so fully fleshed out. 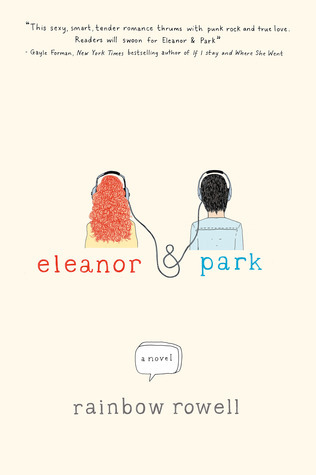 The two main characters, as the title suggests, are Eleanor and Park. Eleanor is the new girl in town. She moves back in with her mother and stepfather after a year’s separation from them in which she lived with friends of the family, her mother has convinced her stepfather to let her return to the family. While having to navigate rebuilding relationships with her younger siblings, she also must navigate a new high school filled with people who – in the way of high school – are always looking to attack the new and different. Which brings us to Park. He is different .He is different from his brother, from his parents, and from the other kids at school. But he grew up in the neighborhood and his Korean mom, whom his dad met while deployed in the military and everyone has become accustomed to his family. He has perfected the level of friendship and interactions which allow him to fly under the radar. Until Eleanor gets on the bus and the only open seat is next to him. This is a YA book, and our protagonists go through a pretty typical high school plotline. But, there’s more depth to Eleanor and Park, and to their lives, than you might expect. Unless, of course, you’ve read Rainbow Rowell’s work before.